I sat down last night to write about Steve Jobs’ resignation as Apple CEO and something funny happened: I had nothing to say. This is not normal for me. I don’t get writer’s block. I often write thousands of words about what many would consider the minutia of tech. And yet, when it came to writing about one of the biggest stories we’re ever likely to see in this space, a story that far transcends tech, I was quite literally at a loss for words. So instead I read what everyone else had to say. Some articles were excellent, many were very good, others read far too much like obituaries. More came today. I kept reading. Slowly, two things struck me. First, I’ve never seen anything quite like the outpouring of emotion that people are showing in response to this news. Second, what we’re witnessing right now is Jobs’ final masterstroke. In tech hubs like the San Francisco Bay Area, it can be easy to get wrapped up in companies, services, and stories that no one in the larger world really cares much about. It’s what some refer to as the “bubble”. But this “bubble” works both ways. It can also be easy to forget that there are many people out there who care just as much about technology as we do. The reaction to Jobs’ resignation is a great reminder of this. Yesterday, TechCrunch saw record traffic thanks to a few stories on Jobs. These posts brought in more readers than any scoop we’ve ever had, any major product review we’ve ever posted, even more than any Apple keynote we’ve ever covered. And our stories were just a few of the thousands upon thousands out there. People could not get enough. Why is that? Again, this is a CEO stepping down. When Eric Schmidt did the same thing earlier this year at Google, it got a lot of press. But it was nothing like this. When Bill Gates left Microsoft, a lot of people took notice. And many wrote tributes. But it was nothing like this. But he is staying on as Chairman of the Board, and as an Apple employee. And sympathy for sickness alone does not come anywhere close to explaining the reaction we’re seeing to the news. This goes much deeper. The root of this lies in the emotional ties that people have with Apple products. And that fact that we’re shifting towards a world where having contact with at least one Apple product on a daily basis is the norm. It may be an iPod, it may be a Mac, it may be an iPhone, it may be an iPad. It may even be an Apple TV. Apple is no longer a small player in the personal computer space, they’re a massive player in the consumer electronics space. In fact, you might say they’re the massive player in the consumer electronics space. And they’ve built this empire not by going after the lower-common-denominator with cheap products. They’ve brought the markets to them. They’ve created new markets. But they have never sacrificed on quality. Apple is a testament to the idea that “little things matter”. Users may not consciously notice all the tiny bits of attention to detail they encounter in Apple products throughout a day, but it is what endears them to these products. It’s why when you pick up a competing product, it just doesn’t feel right even though the specs may be the same, and it may even look the same. It’s also why people who don’t use Apple products don’t understand what all the fuss is about. The fuss is about all of the fuss put into making sure every pixel is exactly where it should be on every screen, in every program, all the time. And Steve Jobs is a personification of all of this. He is a personification of Apple products. Ultimately, that’s why we’re seeing the reaction we’re seeing to his resignation. And it’s an even stronger bond because it goes both ways. Jobs has poured all of his heart and soul into Apple and these products — each and every one of them. I truly believe that passion, while unseen, also translates. It’s like when you meet a good kid and you just know that he has good parents. We appreciate Jobs because he has been such a good parent of these products. He’s a good father in the same way that Walt Disney and Jim Henson were good fathers. Both of those men instilled passion and emotion in people through their products as well. Jobs is also the best salesman of his own products. Apple keynotes without him on stage are still good because the products are usually great. But no one would argue those keynotes are anywhere near as good as the ones in which Jobs is in command. It’s his mixture of charisma, enthusiasm, and authenticity. We want to see Jobs on stage showing off the new products because we know that if he feels good enough about them to present them, that they’re going to be good. As a salesman, no one comes close to the track record Jobs has. We trust his judgement as a result. We’re going to miss that. And we appreciate how stubborn Jobs was in building Apple. It’s a quality that normally carries negative connotations, but it has served Apple well. Jobs’ unwillingness to compromise on his vision and his demand of nothing less than the best has given us the Apple we know and love today. Most companies would never survive such rigidness. And most leaders, no matter how strong, do not either. Somewhere along the line they compromise. They realize they have to when their neck is on the line. And if they don’t compromise, they often get tossed. In fact, this happened to Jobs. In mid-1980s, after a fast start, sales of the original Mac were dwindling. Jobs wanted to hold firm. In fact, most accounts from the time suggest that the thought of doing anything else never even crossed his mind. The Mac was the future. You can’t stop the future from happening. The board saw things another way. Jobs was booted from Apple. Maybe it was arrogance, or maybe it was simply bad timing. Either way, Jobs was never going to compromise. The years that followed made Apple’s maneuver look foolish. Without Jobs, the people in charge nearly destroyed the company that Jobs had built. Maybe the same would have been true if Jobs had remained, but what happened next certainly suggests otherwise. At the 25th hour, Jobs returned. He quickly re-installed his vision. And this time, the timing was exactly right. His vision seemed perfectly in line with the world at large. The result was a 14-year run that took Apple from near-death to the most valuable company on the planet. It wasn’t just hit after hit after hit. It was homerun after homerun after homerun. That’s another thing that hurts about Jobs stepping back. While his age and health suggest that his time running Apple should be near an end or over, his track record in recent years suggests the opposite. Jobs is retiring in his prime. Apple just had its best quarter ever. The iPhone, released just four years ago, is now their most important product. The iPad, released just last year, is a bigger business than the Mac. Earlier this month, Apple pushed past Exxon as the most valuable company in the world. This is Sandy Koufax retiring. This is Barry Sanders retiring. This is John Elway hanging it up after winning two Super Bowls in a row. This is Rocky Marciano walking away undefeated. In his resignation letter, Jobs says that he believes “Apple’s brightest and most innovative days are ahead of it.” And maybe that will indeed be true. But if it is true, it will be in spite of his departure. But those words are also why I think this resignation may be Jobs’ final masterstroke. First of all, when the news hit, the only thing about it that I couldn’t make sense of was the timing. Nearly everything Apple does is meticulously calculated. A late afternoon resignation on a seemingly random Wednesday in August doesn’t seem to fit that mold. But as Peter Burrows and Josh Tyrangiel reported for Bloomberg Businessweek this morning, Jobs spent yesterday at work and attended Apple’s board meeting. It would seem that the timing of this resignation may simply be based around this regularly scheduled board meeting. Jobs undoubtedly wanted to resign in person, and ensure that Tim Cook was installed as the next CEO of Apple. And he did both. Other reports have him being no more or less sick than he has been in recent months. Maybe Jobs picked this seemingly random board meeting in August to formally step down because, why not? Remember, Tim Cook has been serving as CEO for the past eight months. In that time, Apple has remained the hottest company on the planet. In fact, they’ve gotten even hotter. The truth is that from a pure logistical standpoint, Jobs doesn’t need to come back to the CEO role. Perhaps his letter is a simple acknowledgement of that. Or perhaps it’s part of a broader plan. We’re approaching the fall. All indications are that it’s going to be a massive one for Apple. Maybe Jobs wanted to make this move — a formality given the past several months, really — in the relative calm before the storm. The market rewarded this decision. For years, all we’ve heard is about how when Steve Jobs was no longer head of Apple, the stock would be destroyed. The actual result? A 0.65 percent loss for the day. The broader Nasdaq index actually did much worse: a 1.95 percent loss. Had the market risen today, Apple probably would have closed up. Think about that for a second: the day after Steve Jobs steps down as CEO of Apple, Apple’s stock could have easily risen. With the appointment of Cook out of the way, perhaps now it’s on to phase two of Jobs’ last plan: that killer fall. We’ve been hearing since early this year that Apple was planning something special this fall. Until recently, that seemed to be another new iPad. However, the latest talk indicates that component shortages may have pushed that product to early next year. And the truth is that Apple really may not need it. We know the iOS 5 is coming, and very likely alongside the iPhone 5. There will also likely be a cheaper “iPhone 4S”, perhaps sold contract-free. Apple will also undoubtedly refresh the iPod lineup as they always do around this time. And there is talk of the company having some tricks up its sleeve when it comes to new content for iTunes. Oh, and there are also whispers of Apple completely re-doing iTunes itself. Not just the 64-bit re-write we got with iTunes 10. But a total re-working. This fall is shaping up to be a great first act for Cook. All set up by the timing of Jobs’ resignation. The only real question is: is it Cook or Jobs that takes the stage at their event next month to announce these things? Will it be a “hello” or a “goodbye”? But only thinking about the fall is thinking small. It’s the longer roadmap that should really be the grand finale in the Jobs’ fireworks show. Talking to sources in recent months, there has been one common refrain: that the things Apple is working on right now are the best things the company has ever done. These are things that will “blow your mind”, I’ve been told. What type of things? That I don’t know. There is a lot of talk about the entire Mac brand itself being completely re-imagined. We’ll see. What about Apple televisions? We’ll see. The fact that Apple has big plans for the post-Jobs future shouldn’t be too surprising. Product roadmaps are set years in advance. Internally, Apple is undoubtedly already starting to test what will become the iPhone 6. And they probably have the beginnings of the iPhone 7 ready to go too. That’s just how these things work. It’s a bit odd to think about the day after Steve Jobs retires as CEO of Apple, but what if when he says “Apple’s brightest and most innovative days are ahead of it”, it’s not just a platitude? What if he’s saying it because, like other Apple employees, he knows what’s coming? 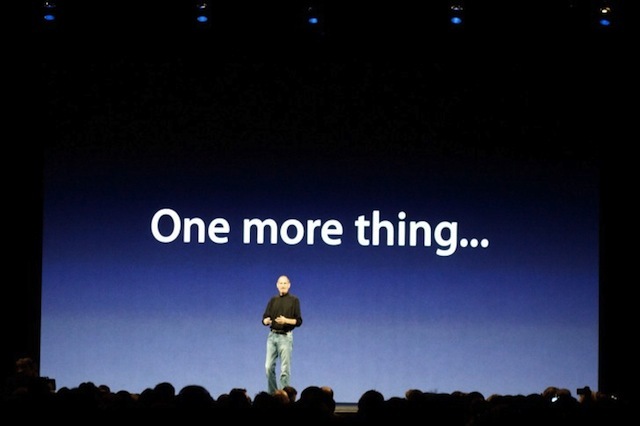 And what’s coming is Jobs’ final “one more thing…”, as it were. It may not be him on stage to present these things, but I have faith that the products won’t be any less great. We’ll just have to see for ourselves instead of instinctively trusting Jobs’ sales pitch. Yesterday, John Gruber wrote that “Jobs’s greatest creation isn’t any Apple product. It is Apple itself.” I’d like to believe the timing and execution of this resignation is meant to showcase exactly that. Jobs has spent decades shaping Apple into what it has become. He’s spent years training Apple’s employees on how to sustain the system in his absence. Now the training wheels come off (with Jobs behind the bicycle just in case, for now). Steve Jobs is a remarkable person. He’ll go down as perhaps the greatest business leader and one of the greatest innovators of not just our time, but of any time. But he is just a man. What he’s built in Apple is much bigger. We’re emotionally tied to Jobs because of the belief that Apple is tied to him. His last act is to show us that it’s not. That would be truly amazing. 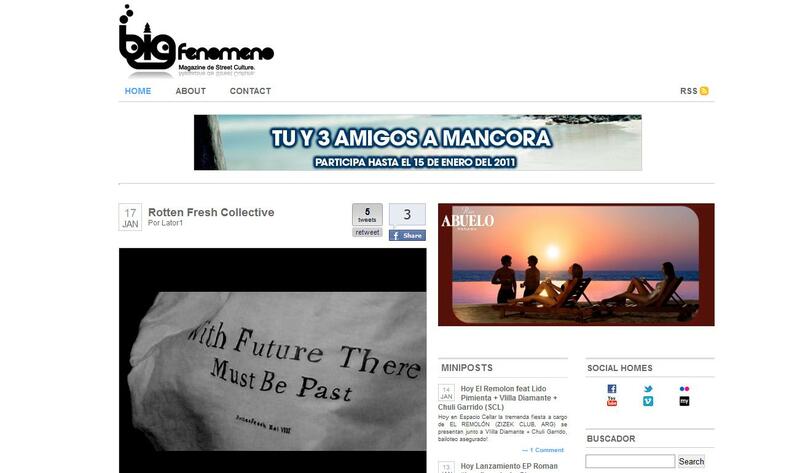 Mario Fuentes Escala: "I connected Blogger to my http://flavors.me page - http://flavors.me/mariofuentesescala"
Bigfenomeno es un blog de habla hispana y spanglish, dedicado al constante movimiento y tendencias del street culture ya sea por medio de la música, la moda, la tecnología, el arte y básicamente todo lo que tenga que ver con lo que pasa en el mundo de la cultura callejera y los jóvenes. Si eres de las personas que gustan de los números limitados o los nuevos juguetes que se venden en Japón definitivamente aquí los encontrarás a diario gracias a nuestros editores que llevan cientos de horas de vuelo web.